I was originally attracted to Hatteras Island because of the pristine, uncrowded beaches. It was the perfect place for a young surfer. The locals had been here for generations and much of that in relative isolation. They were a unique self-supporting people. It took me a little time to assimilate into the community and I soon realized it was so much more than just about the beaches. The people became a big factor in my love and appreciation for the island. Over the years, many of those folks have passed on and my feelings have evolved with those losses. 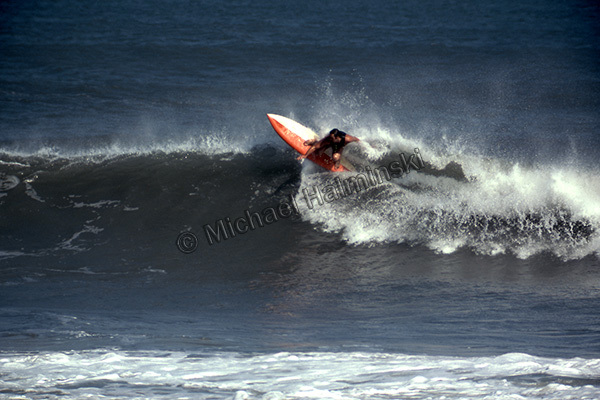 I first met Asa Gray in the early 70’s, out in the waves surfing. Everyone called him Buddy. At the time he must have been 14 or 15 years old. 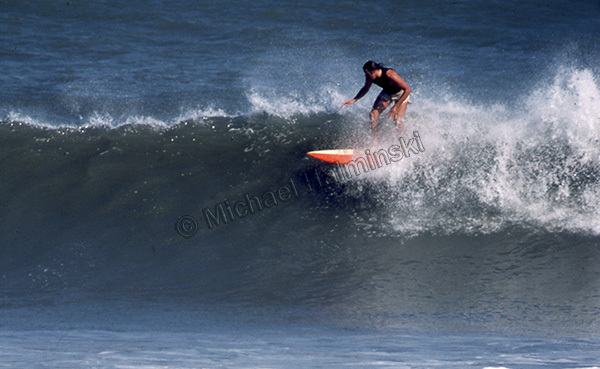 Long haired, lanky yet stout, his surfing was noted for its power and daring to take off on waves that didn’t seem makable. Earlier this month, Buddy passed away at the age of 60. The realization of not seeing him again is unsettling. Even though I hadn’t seen him surf in years, only until recently I could drive down to the harbor in Rodanthe and see what fish he caught. He had commercial fishing in his psyche and an old-school Hatterasman attitude to go with it. 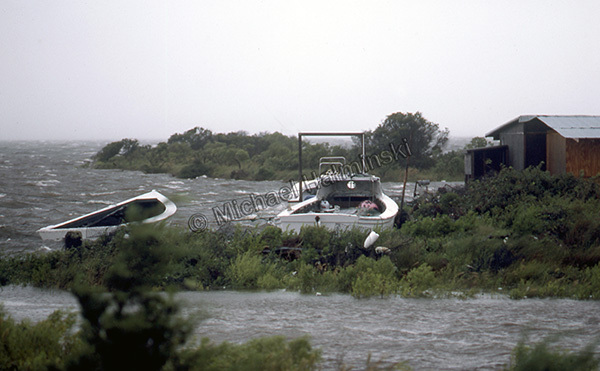 This scene of the Rodanthe Creek was taken during the passing of Hurricane Charley in 1986. It reminds me of the morning I went to the harbor to see if any fishermen went out to their nets. Northwest winds were gale force as I watched an incoming boat skipping over the tops of the foamy waves and getting blown sideways at the same time. It looked as if the vessel would flip over as gusts got up under the pounding hull. He had pulled all his nets in the boat and was loaded to the gunnels. I never saw such a harrowing approach from that channel. As the boat reached the shelter of the harbor and settled down, it was Buddy Gray, soaked and glad to be back ashore. I’ve never seen any thing like it since. 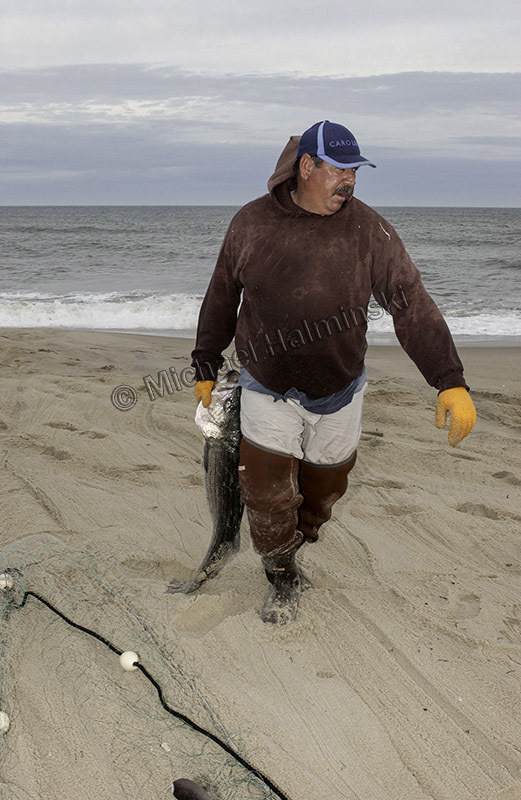 Buddy was pulling a rockfish onto the beach in Rodanthe when I took this shot in 2004. Rest in peace my old friend. Things will just not be the same as they once were. This entry was posted in commercial fishing, boat, pamilco sound, gillnetting, Fishing, Outer Banks, People, surfing on July 25, 2018 by j0jgvm89bj.